Brian Yoon is looking for a fourth WSOP bracelet. 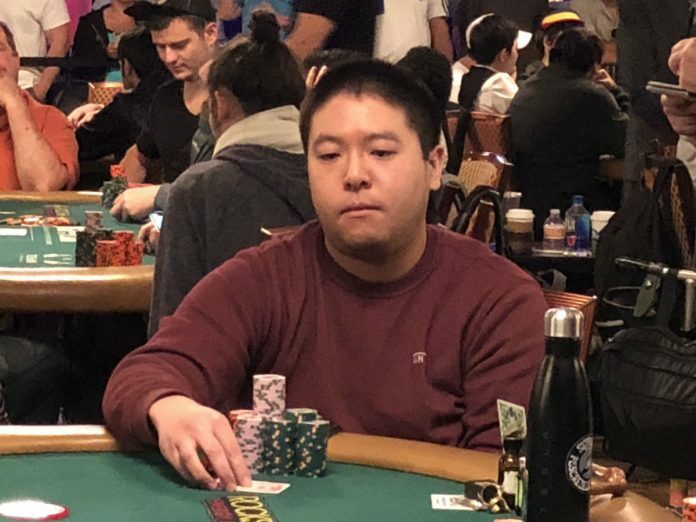 Amidst the carnage that was the first level and a half of Day 5 play in the 2018 World Series of Poker Main Event, Brian Yoon continued to push ahead and took his 3,228,000 starting stack all the way up 5,000,000 very quickly. “It’s been nothing but good basically. I just immediately got involved in like two or three really big pots and won all of them, so it worked out pretty well,” said Yoon. It shouldn’t really be too much of a surprise to see Yoon putting up a solid run in the Main Event. He’s done it before. He finished 58th in 2011, 498th in 2014 and then 60th in 2016. He’s also won three bracelets already, all in big No Limit Hold’em field events. In 2013, Yoon beat 4,755 other players to win the $1,111 Little One for One Drop. The next year he topped a 550-player field in a $5,000 Eight-handed No Limit Hold’em event. His third bracelet came last summer, when he beat 6,715 other players to win the $1,500 Monster Stack. “There’s no correlation, obviously they’re kind of similar fields. I just feel like I just have a good understanding of how to approach this tournament, luckily it’s been paying off,” said Yoon, who has $4.39 million in lifetime earnings, including $2.8 million from WSOP events alone. Yoon moved from California to Las Vegas just over two years ago. It might seem to make sense for a poker pro to make the move to the poker capital of the world, but it was less about being close to games and tournaments and much more about the financial implications of living in Nevada. Following his 2017 bracelet win, Yoon admitted he was going to play much less poker than he had in years past. This wasn’t some formal retirement announcement though, Yoon just felt like he was in a good enough place financially where he could pick and choose which tournaments he wanted to play.